Sámi is a branch of the Uralic language family. 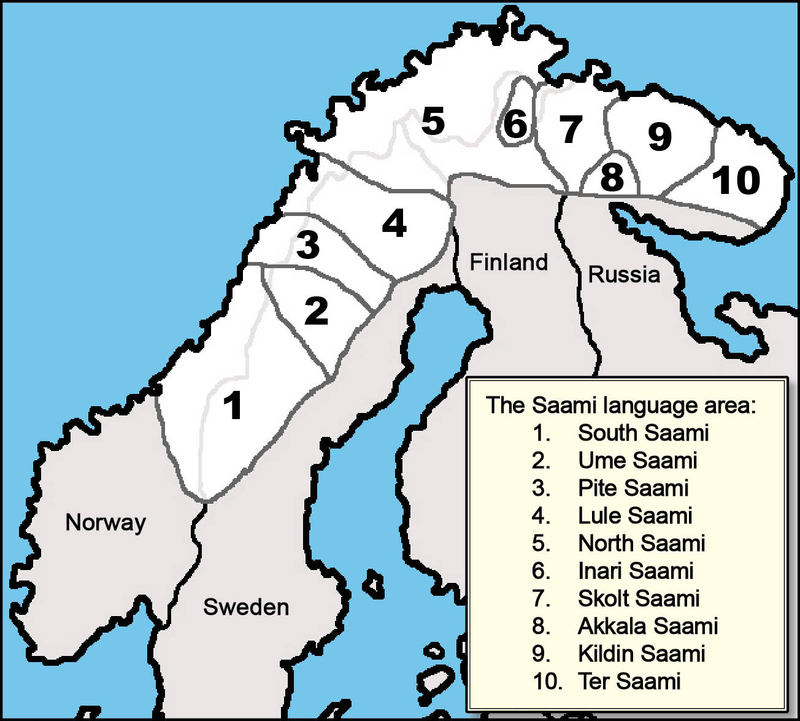 All Sámi languages are fairly similar in grammatical structure and lexicon. They form a dialect chain stretching from central and northern Scandinavia to the eastern tip of the Kola Peninsula in Northwest Russia. The four Kola Sámi languages Ter Sámi, Kildin Sámi, Akkala Sámi and Skolt Sámi belong to the East-Sámi subgroup. Only Skolt Sámi is also spoken beyond Russian territory in Finland and Norway. A typical feature in the phonology of most Sámi languages is the occurrence of preaspirated voiceless stops and affricates. These sounds also occur in Kola Sámi languages. A specific characteristic in Kola Sámi phonology not found in other Sámi languages is the relatively large phoneme inventory. Most consonants, including sonorants, exhibit a voice opposition. Furthermore almost all consonants have a phonologically distinct palatalized counterpart. As for the nasal and lateral dentals /n/ and /l/ there is an opposition not only to the respective palatalized phonemes /n’/ and /l’/, but also to the nasal and lateral palatals /ɲ/ and /ʎ/, cf. Kildin mann (манн) /man:/ ‘moon; month’, mann’ (маннҍ) /man:’/ ‘egg’, mannj (маннь) /maɲ:/ ‘daughter in law’; pāll (па̄лл) /pa:l:/ ‘ball’, māll’ (ма̄лль) /ma:l:’/ ‘juice’, māllj (ма̄лльй) /ma:ʎ:/ ‘rust’. The morphology in Kola Sámi is predominantly concatenative and almost exclusively suffixing. Some inflectional forms are marked by nonlinear morphemes, either consonant gradation (like in kuess’k : kues’k in the noun paradigm below) or vowel ablaut (like in jēll’e : jīll’e in the verb paradigm below). Consonant gradation, vowel ablaut and other kinds of stem allomorphy occur also regularly as the result of paradigmatic morphophonological processes. Since most morphological features are coded by cumulative formatives and chains of more than two suffixes scarcely occur, Kola Sámi langauges are characterized by much weaker agglutination than other Sámi and Uralic languages. Nouns belong to different inflectional classes and inflect for two numbers and 9 cases. Number and case marking is merged into portmanteau suffixes exhibiting a few syncretic forms. In essive and partitive number inflection is missing. Pronominal inflection resembles that of nouns. Note that a third number value, dual, characterizing the pronominal inflection in several other Saamic languages is missing. Kildin Saami has also lost the possessive inflection of nouns. The historical possessive suffixes, mostly the 1st person singular, occur only in a few lexicalized kinship nouns, like Kildin jānna (я̄нна) ‘my mother, mommy’. Also verbs belong to different classes and exhibit infinite and finite inflection, the latter with three moods, two tenses, two numbers and three persons. Tense, number and person marking is merged into portmanteau suffixes. Beside three personal inflections there is a fourth impersonal from in the indicative mood, like in Kildin tārr’m jēl’et’ šīgtenn’e (та̄ррьм е̄летҍ шӣгтэннӭ) ‘today one lives well’, ēvvtel’ jīll’eš’ per’a (е̄ввтель ӣллешь пэря) ‘in former times one lived better’). Note that a third number value, i.e. dual characterizing the verbal inflection in most other Saamic languages, is missing in Kola Sámi. In some Kola Sámi varieties even the potential mood inflection is lost. Derivational morphology is very rich, especially for verbs where it codes aktionsart, passive and diminutive, among other features. Phrase structure is for the most part head-final, including the predominant occurrence of postpositions instead of prepositions and strict head-finality in noun phrases with noun, adjective, and pronoun modifiers. Relative clauses, however, follow the noun they modify. In the verb phrase a shift from SOV to SVO word order seems to be taking place. Attributive adjectives do not agree with the modified noun, unlike pronoun and numeral modifiers, which show limited case agreement. Another interesting feature in the morphosyntax of noun phrases is partive case marking of subject and object nominals which have quantifiers as determiners. Like in all other Saami languages negation in Kola Sámi is expressed by means of an inflected negation auxiliary followed by the non-finite main verb in a special connegative form, like Kildin munn puada (мунн пуада) ‘I come’, munn [1sg] emm [neg.1sg] pued’ [conneg.nonpast] (мунн эмм пеэдҍ) ‘I don’t come’. The first Kola Sámi book written (partly in Kildin, partly in Akkala Sámi) was the Gospel of Matthew published 1878 in Helsinki. The Finnish linguist Arvid Genetz translated the text with the help of Sámi consultants. The same text in Skolt Sámi was translated by the Russian orthodox priest from Pečenga Konstantin Ščekoldin and published in Archangel’sk 1844. The first Kola Sámi dictionary was also written by Genetz (1891) and is based on his Bible translation and a few other collected texts. Even the first short grammatical description of Kola Sámi languages, written in Hungarian by Ignácz Halász, (1883) is based on Genetz’ original work. The Russian linguist Aleksandr Endjukovskij was the first auther of a Kildin Sámi school grammar (1937). Toivo Immanuel Itkonen was a Finnish linguist who wrote a comparative Kola Sámi dialect dictionary in 1958. This dictionary is still the most comprehensive source for Kola Sámi vocabulary. The first comprehensive descriptive grammar of a single Kola Sámi language (i.e. Kildin) was published by the Russian linguist Georgij Kert (1971). A Kildin Sámi-Russian dictionary including a prescriptive grammatical sketch was written by a group of Sámi teachers led by the non-Sámi linguist Rimma Kuruč (1985), other bilingual dictionaries are produced by Kert (1986) and another one by the Finnish linguist Pekka Sammmallahti together with the Kildin Sámi Anastasija Chvorostuchina (1991). The latter dictionary includes a short appendix with the most basic inflectional paradigms. A new Cyrillic orthography for Kildin Saami has been developed since the 1980s. It is used in the three aforementioned dictionaries, in textbooks for elementary schools as well as in several published literary texts.